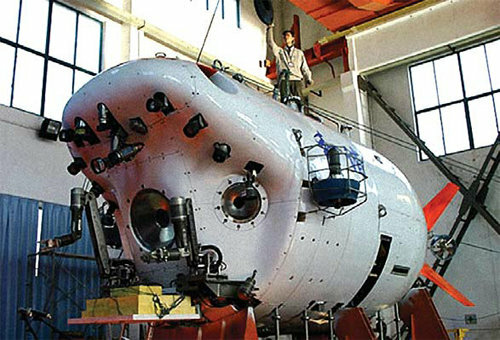 China has made its position in deep sea exploration known to the world after officially welcoming its newest deep sea submersible, Jiaolong. This 27-foot, 22 ton sub was designed to reach depths of 23,000 feet (7,000 meters) and already has 17 dives under its belt with the deepest dive to a depth of 12,332 feet (3,759 meters) making China only the fifth country to dive past the 3,500 meter mark. Plans are also underway to build a research base estimated to cost around $73 million at the coastal City of Quingdao, in Shangdong province to serve as a support station for Jiaolong. Chinese scientists believe deep sea beds between 4,000 and 6,000 meters hold abundant deposits of rare metals and methane hydrate, a solidified form of natural gas bound to ice, which could help satiate China’s energy appetite. This entry was posted in Marine Biology, Science and tagged Deep Sea exploration, Deep Sea Science. Bookmark the permalink.